You exfoliate your face, and you exfoliate your skin — but do you exfoliate your scalp? This revitalizing mask removes buildup and sebum from scalp, effectively cleansing hair follicles and also conditioning your hair. It's fantastic as an everyday conditioner or as a pre-shampoo mask. 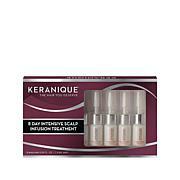 Give your scalp the attention it deserves, with the help of Keranique. Ingredients: Water (Aqua), Cetearyl Alcohol, Behentrimonium Chloride, Polylactic Acid, Butylene Glycol, Cetyl Alcohol, Amodimethicone, Cetyl Esters, Hydrogenated Ethylhexyl Olivate, Glycerin, Jojoba Esters, Simmondsia Chinensis (Jojoba) Seed Oil, PEG-40 Hydrogenated Castor Oil, Cyperus Esculentus Root Oil, Isododecane, Propanediol, Stearamine Oxide, Ethylhexylglycerin, Zea Mays (Corn) Starch, Arctium Majus Root Extract, Panax Ginseng Root Extract, Hydrolyzed Ceratonia Siliqua Seed Extract, Vicia Faba Seed Extract, Trideceth-12, Prunus Armeniaca (Apricot) Seed Powder, C11-15 Pareth-7, Polysilicone-15, PPG-26-Buteth-26, Laureth-9, Quaternium-95, Cystine Bis-PG-Propyl Silanetriol, Hydrolyzed Keratin, Keratin, Hydrolyzed Vegetable Protein PG-Propyl Silanetriol, PEG-12 Dimethicone, Panthenol, Polysorbate 60, Fragrance (Parfum), Guar Hydroxypropyltrimonium Chloride, Cetrimonium Chloride, Menthol, Acetyl Tyrosine, Apigenin, Arginine, Calcium Pantothenate, Hydroxyethylcellulose, Zinc Gluconate, Biotin, Oleanolic Acid, Biotinoyl Tripeptide-1, Glucosamine Hcl, Hydrolyzed Soy Protein, Niacinamide, Ornithine HCl, Polyquaternium-11, Hydrogenated Olive Oil Unsaponifiables, Polyquaternium-7, Citric Acid, Tetrasodium EDTA, Pentaerythrityl Tetra-Di-T-Butyl Hydroxyhydrocinnamate, BHT, Caprylyl Glycol, Phenoxyethanol, Chlorphenesin, Benzoic Acid, Sorbic Acid, Methylisothiazolinone, Benzyl Alcohol, Coumarin, Limonene. This hair mask did a great job on my hair. I will buy again before I run out. I've had pretty good success using Keranique products and where I had been thinning so much now I feel my hair is denser and I'm not losing as much hair as I use to. This Revitalizing Mask is just another product I've incorporated into my routine -- I use it about every two or three washes. I purchased this product to remove build up, condition my hair and increase the volume, and it actually does all 3 things. 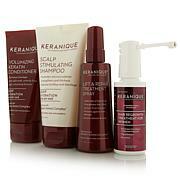 I am actually trying to use everything from the Keranique line (due to my hair thinning because of hormones). I used the shampoo, conditioner and growth liquid for almost a year, and now I am excited to try some of the other products. I love the smell of this mask (clean and natural-y), and there are these little beads (keratin , I think), and I just leave it on for a little after I shampoo or I use it by itself for a deep conditioning treatment. 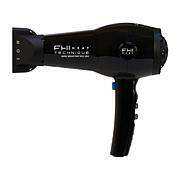 The next day, my hair always feels lighter (less buildup), but also soft with added volume and shine. I use it once a week and that works perfectly. I highly recommend this product! I am a professional gardener. 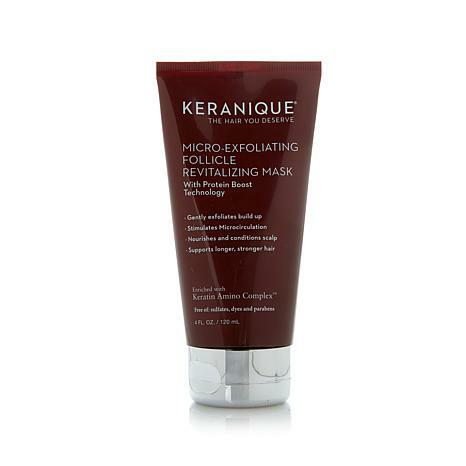 My scalp gets dirty.This exfoliating cream is the best to clean your scalp. My husband has dandruff; I have him using it too. Believe it or not, he is going to go purchase a shower cap so the process is more effective.We would recommend this product to everyone. Remind me about Keranique upcoming shows.